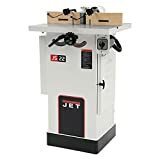 Jet JWS-22CS / 708320 1-1/2 HP Woodworking Shaper buy / read reviews : Amazon.com Tools and Hardware Store. Let your work take on a whole new shape with this 1-1/2 hp woodworking shaper from Jet. Industrial push button controls and a heavy-duty one-piece stand with motor cover for stability are just a few of the great features on this shaper. There's an extra large cast-iron work surface, and safe, accurate spindle height adjustments made possible with a hand wheel and spindle lock. Two reversible spindle speeds add to the shapers versatility. The left and right fences are independent and feature micro adjustment with no clearance capabilities. And, adjustable workpiece hold downs are mounted to the fence. Your purchase includes 1/2- and 3/4-inch interchangeable spindles, 1/2- and 1/4-inch router bit collets, miter gauge, cutter guard, and 4-inch dust chute.